Captain Doug Springer and his wife, Diane Upton, returned to Wilmington in 2004, to pursue their dream of life on the water. The Wilmington is the first and finest state-of-the-art catamaran to serve Historic Downtown Wilmington, NC. The Wilmington has a wake canceling design and is fully enclosed (heat if needed). She is handicap accessible and offers a flexible layout for comfortable seating up to 49 guests. All ABC permits and spacious restroom complete the package. Come downtown and visit us, you’ll be impressed with our 46′ catamaran, The Wilmington. 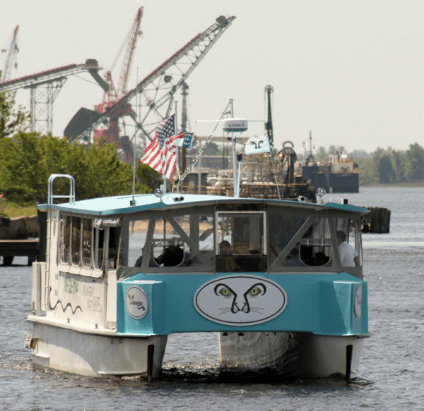 Wilmington Water Tours is based out of Wilmington, North Carolina, here to serve the city and its new convention center. They offer sunset cruises and private charters. Their investment in the custom design and state of the art catamaran, The Wilmington, the first vessel of hopefully many, allows Doug and Diane to provide a wide range of offerings.